Who is brave in the face of death, ancient spirits, darkness beyond darkness, for scientific exploration of human history, accomplishments, and life’s footprint on earth? Cave divers are intrepidly exploring where few dare and those that do, know the perils. Peter Campbell, a cave diver who is exploring where few dare, knows the perils. 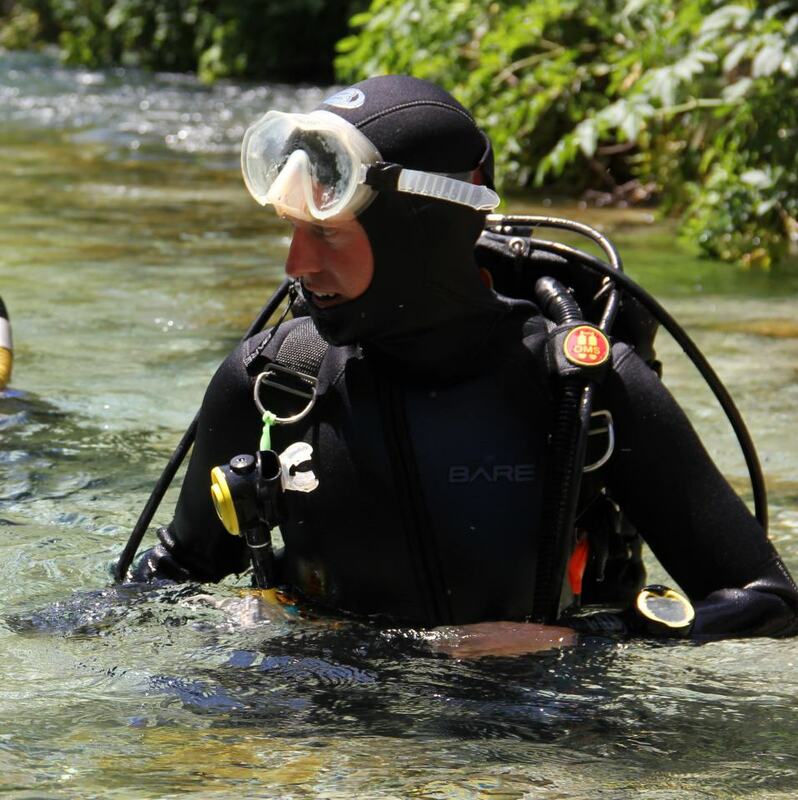 As an underwater archaeologist for Cave Archeology Investigation and Research Network (CAIRN) and the Archeological director for the Albanian Center for Marine Research, he identifies cave diving as probably the most dangerous sport along with the most dangerous profession – deep sea fishing. It is imperative to understand the dynamic to reach an underwater cave or partially flooded terrestrial cave. Each is flush with challenges – water currents; the structure and map of the spring or sinkhole; visibility; unknown pockets and territory; and all the while calculating the amount of oxygen gas to safely explore, research and return in very precise movements. As though even more challenging than balancing on a precipice of a mountain cliff, each movement is choreographed with absolutely no easy escape from danger, opportunity for emergency release or a reasonable rescue. Being one of a few, Campbell’s quest to explore and unearth new knowledge of ancient cultures, fauna, and artifacts is similar to any legendary explorer, who not for an individual personal record but one for world knowledge. Yet, still anoxic waters and mud hold the secrets to our past. With no or little disturbances from natural decay or human interference, underwater caves preserve remains of fauna, humans, artifacts of hunting and even art. As though one last effort to prevent discovery, the water and mud act as a barrier, clutching its most private personal knowledge from mankind unless there is one worthy of the knowledge. Recently, American Antiquity released a study on cave art being done primarily by women. On the surface, one can lightly overlook this statement until one understands the structure of a cave and how humans and animals interacted in the spaces of a cave. Campbell shares that families, communities lived in the light zone – the opening of a cave, the space below a rock overhang, a very simple shelter. Then, there is the transition zone with minimal signs of human presence. Then past the point of light, the transition path leads into the dark zone, the darkest of dark spaces, with absolutely no light. It is here, in the dark zone, that the art often is discovered. How did these women reach the inner most cavern? Was this an act of faith? How did they even know that there was a space beyond? Why record human stories in the darkest area that few if any ever will observe? The more one scratches the surface of caves, the more questions one has. Are sacred water spaces actually the portal to learning our past to know our future? In almost all cultures, water evokes a mystical quality. Imagine all of the fountains around the world that receive coins in return for granting a wish. The Trevi Fountain in Rome, perhaps is the most famous. Legend has it that with a gift of a coin each visitor will return. “saw caves a bit like we see big cathedrals; awe inspiring ritual centers that connect people to spiritual realms and cosmology”. The Blue Eye spring in Albania where Campbell is directing a research project is revealing on the catch all ledge below the surface coins matching the powers that were in the area, Roman, Communist era and now, modern coins along with animal bones indicating sacrifices from the pre-Roman and Roman eras. But to actually get to the catch all ledge is Campbell’s greatest challenge. In order to submerge below the surface, Campbell has to negotiate the currents that refuse easy entry. Another remarkable discovery is the Little Salt Spring in Florida which is not little and not undemanding. In fact, quite the opposite. Little Salt Spring is a wet burial ground filled with fauna, Native American Indian remains and artifacts of hunting. It challenges the best divers to travel with extreme care as they enter the spring’s womb. As divers explore, the myth of creation according to the Archaic Indian community becomes illuminated – with the powerful lower world filled with long extinct large wild animals protecting ancestors. Following the tradition of the powerful upper world filled with good and evil spirits in balance with the lower world filled with even more powerful good and evil spirits – the middle world – one must always find the balance between the two, upper and lower, good and evil. Death, in a way, becomes a portal to learning of the living, their sacred rituals, beliefs, communities and ultimately, their interactions on earth. Currently, Campbell is editing and writing a book on The Archeology of Underwater Caves along with the legendary explorers and pioneers of underwater caves. Observing the results of climate change and the sea level, the underwater archeology in the Americas recovering Mayan artifacts, the underwater caves in France, the Gods and ritual life, the Cosquer Cave and its paintings and engravings are among the numerous topics to be covered in the book. Contributors to the book include archeologists and underwater cave divers from around the world: Nic Flemming, father of oceanography; Fabrizio Antonioli; the original cave divers Daniel Lenihan and Larry Murphy; W.A. Cockrell; John Gifford who has researched Little Salt Spring for the last twenty years; Yves Billaud; Eduard Reinhardt; Dominique Rissolo; Guillermo de Anda; Geoffrey W. Conrad; Charles D. Beeker, John W. Foster; Jean Clottes; Jean Courtin; Jacques Collina-Girard; Dominque Rissolo; Pilar Luna Erreguerena; Alberto Nava Blank; James C. Chatters; Douglas Kennett; Yemane Asmerom; Brian Kemp; Shanti Morell-Hart; Shawn Collins; Lee Newsom; Lauren Milideo; Paolo Caputo; John Peterson; Andrew Kinkella; and Lisa Lucero. The Archeology of Underwater Caves should be available in late 2014 and expect it to be a best seller. Peter Campbell and these legendary explorers share their risks and accomplishments to reveal the last frontier for human exploration on earth, the rarely exposed underwater caves. Only the bravest and most worthy are given access to the cave’s secrets. Tags: Alberto Nava Blank, Andrew Kinkella, Brian Kemp, CAIRN, Cave Archeology Investigation and Research Network, cave divers, Charles D. Beeker, Daniel Lenihan, Dominique Rissolo, Dominque Rissolo, Douglas Kennett, Eduard Reinhardt, Fabrizio Antonioli, father of oceanography, Geoffrey W. Conrad, Guillermo de Anda, Jacques Collina-Girard, James C. Chatters, Jean Clottes, Jean Courtin, John Gifford, John Peterson, John W. Foster, Larry Murphy, Lauren Milideo, Lee Newsom, Lisa Lucero, Nic Flemming, Paolo Caputo, Peter Campbell, Pilar Luna Erreguerena, Shanti Morell-Hart, Shawn Collins, The Archeology of Underwater Caves, underwater cave diving, underwater caves, W.A. Cockrell, Yemane Asmerom, Yves Billaud. Bookmark the permalink.